We are often asked by prospective clients to provide detailed itineraries before a tour begins. While it may seem unhelpful, we are not able to do so, mainly because of the type of service we offer; particularly the in-depth research conducted on behalf of our guests. This planning results in our tours providing a richly rewarding, personal and intimate experience. Initial research at the National Archives in Ottawa for soldiers’ personnel files and war diaries and by extension, official and unit histories, provides the structure for our uniquely, customized tours. Unfortunately there can be delays, beyond our control in this research process, resulting, in many cases, not being able to acquire this research until a few days before the tour is scheduled to begin. Furthermore, we often continue to receive bookings right up to a few weeks before a tour, which makes it even more difficult to produce a comprehensive tour plan until the very last minute. We do hope that prospective guests will appreciate these reasons why detailed itineraries can’t be provided in advance. The very essence of CanadianBattlefieldTours is to keep every tour individualized and custom tailored to the requirements of our guests. We do, however, advise guest of the B&B’s and hotels where they may choose to stay on their tour, along with relevant contact details, on receipt of the tour balance payment. For a sample of an itinerary, please visit any of the tours listed on the Tour Options menu link above. Canadian Battlefield Tours crafts each tour itinerary around the needs and/or wants of the guests who tour with us. Our itineraries are not “etched in stone” and we are always willing to cater to the particular interests of our guests. The itineraries are flexible and are not constrained by rigid timetables. We proceed at your pace and almost always include sites not shown on the itinerary. Our guests are most appreciative of this flexible, laid-back approach. The most notable landmarks and memorials, known by all Canadians, will always be included in our tours. 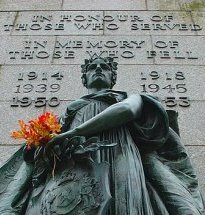 For example, no tours to the WW1 front, would be complete without visiting Vimy Ridge, John McCrae’s “Flanders Field” Essex Farm, Passchendaele, Beaumont Hamel, Newfoundland Park, the Somme, or attending the Last Post ceremony at the Menin Gate in Ypres. All are of prime importance to Canadians. Similarly, our Normandy tours will always include the D-Day beach landings at Juno, the Juno Beach Centre, Beny-sur-Mer Canadian War cemetery, the Abbey d’Ardennes, where 20 Canadian prisoners were summarily executed by Col. Kurt Meyers infamous 12th SS Hitlerjugend. With the use of battlefield maps, war diaries and regimental records, we present an accurate account of what took place at the locations visited. We are always happy to advise on the most appropriate battlefield tour for your needs so that you may attain the maximum possible benefit from your once-in-a-lifetime experience.